no charge for cancelation warnings 30 days before arrival. River studios and apartments(082K123K3721000) located between the two popular resorts of Moraitika and Messonghi. The property is approx. 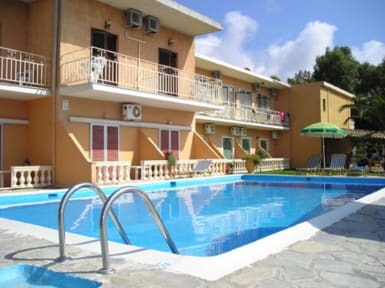 200m walk to the beach and only a couple of min from the bars, cafes, local shops, tavernas and nightlife in the resorts. 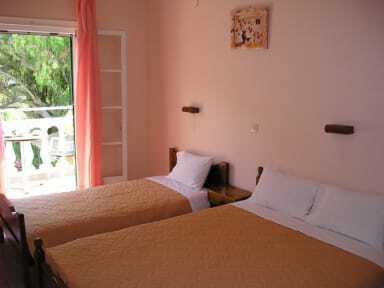 The complex consist of 19 studios and 3 apartments with capacity for 2 and 6 persons. Studios are bedsitter type with entrance hall and small kitchen (2 ring cooker, fridge etc. ), bathroom and bedroom with terrace leading off. All of studios have balcony. Apartments have two separate twin bedrooms, lounge with 2 couches, separate kitchenette, bathroom and two balconies overlooking the pool. All the rooms are with tv and air condition. Our check out time is 12:00pm. Breakfast is not included in our rooms rates. Cute apartments near a small town and beach as well as a few shops. Beds comfortable and rooms clean too!